Вот прямо сейчас, работая со своими студентами над заполнением онлайн анкеты, я столкнулся с ранее описываемым вопросом (Информация в помощь заполняющим заявление на получение Ирландской визы в электронной форме) по поводу того, что если в пункте анкеты Do you speak English? — выбрать Yes, то предлагается указать уровень владения языком согласно основных международных экзаменов по английскому языку, типа IELTS или TOEFL. Этот пункт всех и всегда пугает. Сразу Вас хочу настроить — не стоит здесь ничего бояться и переживать за него. На данный вопрос Консульство Ирландии в Украине дало однозначный ответ — выбирать ответ «Да», даже если у Вас нет сданных международных экзаменов на знание английского языка. Уровень указывать согласно данным сертификатов от «местных» курсов английского языка. Дабы упростить Вам решение этого вопроса, я хочу здесь опубликовать таблицу с очень удобным примером сравнения уровней владения английским языком по разным тестам и системам оценки. be able to shop or travel with basic English. You will know the fundamentals of English pronunciation. CAMBRIDGE KET You can understand language used in everyday situations if the speaker speaks slowly and clearly. make simple sentences and reply to simple questions; talk about likes/dislikes, family and routines; order a meal in a restaurant/go shopping and understand and write basic text. TOEIC 301-400 You can communicate in a range of everyday social and travel contexts. talk with confidence (go shopping, book a hotel room); make conversation in English; write & understand simple written text and understand a wider range of grammar and vocabulary. CAMBRIDGE PET You can speak English with some confidence. take part in routine conversations; write & understand simple written text; make notes & understand most of the general meaning of lectures, meetings, TV programmes and extract basic information from a written document. CAMBRIDGE FCE You can use English effectively. CAMBRIDGE CAE You can use English in a range of culturally appropriate ways. take part in lengthy conversations & discussions; write and understand most text including formal, academic and professional documents; easily understand TV, plays, films, lectures and presentations. 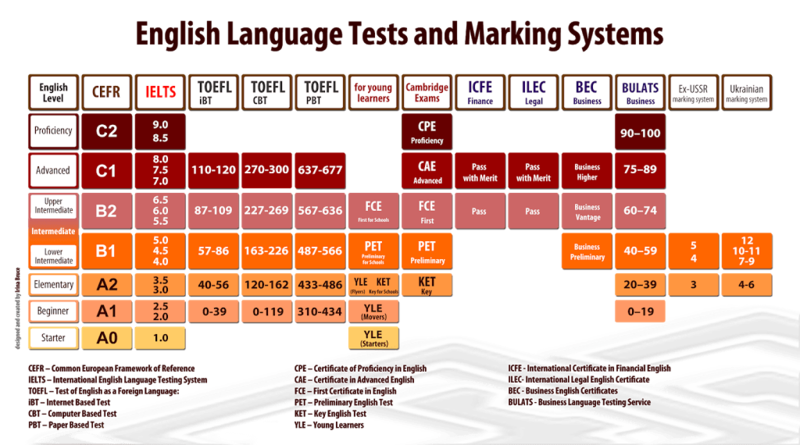 CAMBRIDGE CPE You can use English with ease and fluency. Increase your understanding of the nuances of the language and engage in independent reading to develop your vocabulary further. You can handle situations of everyday life with a confidence and competence similar to your mother tongue. You can take part in lengthy casual conversations, and discuss abstract or cultural topics fluently. You can write a full range of texts e.g. letters, e-mails, essays with a confidence and competence similar to your mother tongue. You can fully understand all casual conversations, the media, lectures, talks and phone conversations with a confidence and competence similar to your mother tongue. You can understand the full range of texts with a confidence and competence similar to your mother tongue. Your reading speed is comparable to that of your mother tongue. You have no problems dealing with the routine situations of everyday life. You can take part in lengthy casual conversations, and discuss abstract or cultural topics fluently and with a good range of expression. You can write letters and e-mails of many familiar types, produce more formal types of letters, make notes from written sources and write an essay, although errors in grammar, vocabulary and style will occur. You can take part in a variety of lengthy casual conversations. You can understand most of what is available on TV and radio and in plays and films. You can understand most of what is said in a lecture, presentation or demonstration You can read at a good speed and readily understand different kinds of texts: magazines and newspapers, academic and professional articles. You can confidently deal with situations that may arise in shops, restaurants, and hotels, and express pleasure or displeasure at the service given. In social conversation you can talk about a range of topics and express opinions to a limited extent. You can write most kinds of letters and e-mails and produce a range of written documents. However they may need to be checked by a native speaker if accuracy and register are important. You can write an essay showing communicative ability. You can understand casual conversation, most of a TV programme, and the main points of a radio programme. You can understand a guided tour well enough to ask and answer questions. You can follow presentations or demonstrations and the general meaning of a lecture. You can understand routine letters, basic newspaper and magazine articles, texts related to factual topics or to your own tastes in fiction. You can understand short reports or articles on familiar topics, but not more theoretical material e.g. technical reports. You can confidently deal with situations that may arise in shops, restaurants, and hotels; you can get standard information from a Tourist Information office, and understand the main points of a guided tour. You can take part in a routine conversation on predictable topics. You can write short notes, messages, simple letters and e-mails although these will need to be checked by a colleague. You can make notes during a meeting. You can write down some information at a lecture and you can write a simple narrative, but not an academic essay. You can understand language used in everyday situations, the general outline of a guided tour, the general meaning of a TV programme, and a simple phone message. You can understand some parts of a lecture and take a limited part in a seminar or tutorial if allowances are made for non-native speakers. You can understand simple texts used in everyday practical situations and the general meaning of simple articles in newspapers and leaflets. You can read and act on such things as standard letters and reports on familiar topics. You can extract information from a textbook or academic article. You have a good basic ability to communicate in practical everyday situations. You can ask for goods in shops, order in a restaurant, book a hotel room, ask for basic services in a post office or bank and indicate the nature of a medical problem to a doctor. You can write simple comprehensible notes, messages, postcards, faxes, e- mails and letters although you often need to re-write and refer to a dictionary. You are beginning to understand natural speech. You can understand language used in everyday situations. You can understand such things as prices in shops, simple directions on how to get to places, questions and instructions from a doctor and routine questions asked at Immigration. You can understand texts in practical situations: eating out, shopping, and using services such as banks. You can read standard letters, and derive basic information from factual texts and make limited use of information sources such as computers and bilingual dictionaries. You can communicate in practical everyday situations. You can, for example give personal data, name address, family members, home town etc. You need to re­phrase and repeat, and need the help of a sympathetic listener. You can write short simple factual notes and messages. You write slowly constantly re­writing or referring to a bi­lingual dictionary. You can understand language used in everyday situations if the speaker speaks slowly, clearly and repeats or reformulates. Comprehension frequently depends on mother tongue or on visual support or demonstration. You can understand short simple texts in everyday practical situations. You need to use your mother tongue and visual support to help you understand and you read slowly, constantly re-reading or referring to a dictionary. You can only communicate in very controlled situations. You speak with tittle confidence, constantly repeating and repairing your language. You have to rely on international words and your mother tongue to help you communicate. You can only complete forms or documents with personal or travel details mostly at the single word level. Any social or other message is very difficult for you to write and equally difficult to understand. You can understand only the most basic messages and announcements. You need translation or visuals to feel confident you have understood and require slow, clear and repeated spe.ech to aid understanding You can understand simple, brief public signs and notices You can identify the topic or basic message in texts but you need translation or visuals to feel confident you have understood. Здравствуйте, Алексей! Обязательно ли указывать свой уровень знания английского языка по IELTS, или можно просто написать название курса, который я прошла и уровень "upper intermediate"? Здравствуйте, Наталья!Нет, IELTS не обязательно указывать. Для стран бывшего СССР посольство Ирландии делает исключение и готово рассматривать языковые уровни согласно данных об окончании местных языковых школ и курсов. Так что в разделе онлайн анкеты Test taken - указываете название Вашей языковой школы (курсов), дата - ставите дату выдачи сертификата и уровень - Ваш уровень по сертификату: upper intermediate.Буду рад ответить на вопросы!